In a somewhat shocking display of good sense, the Blue Jays organization seems to have realized what right-minded Blue Jays fans have been saying for some time now. Ryan Goins is not a major league starter. Having finally come to this realization, the Blue Jays sent him packing to Buffalo with Chris Getz getting recalled to take his place. Goins had to go, that much is clear. Despite the talk from the front office and all the fans that swallowed it, no glove is good enough to carry a .218/.243/.302 batting line, which has given him a 45 wRC+ since the Blue Jays called him up last August. If you only look at what he's done in 2014 it's an even uglier picture, as that batting line falls all the way to .150/.203/.217 and a pitiful 14 wRC+. 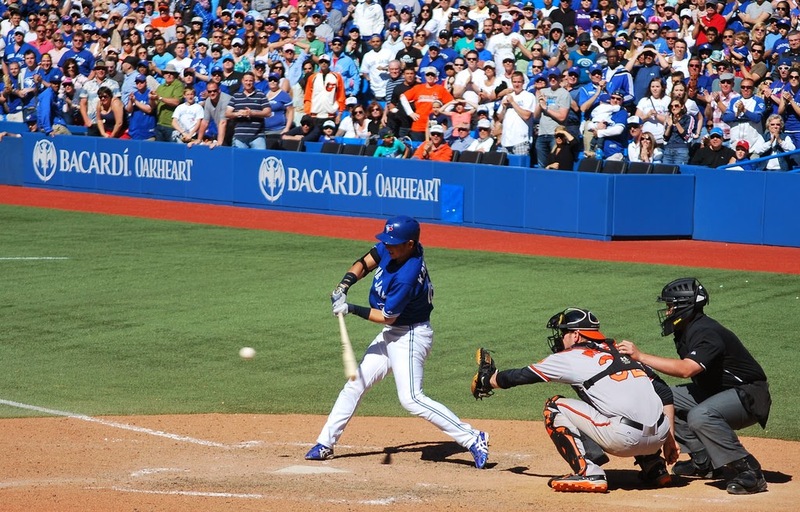 That is the very definition of a black hole in the lineup, and the Blue Jays had to do something to wring more production out of second base, especially with the slow starts some of the bigger bats have been experiencing. Well they did something, but it's uhh... well at least it's something. 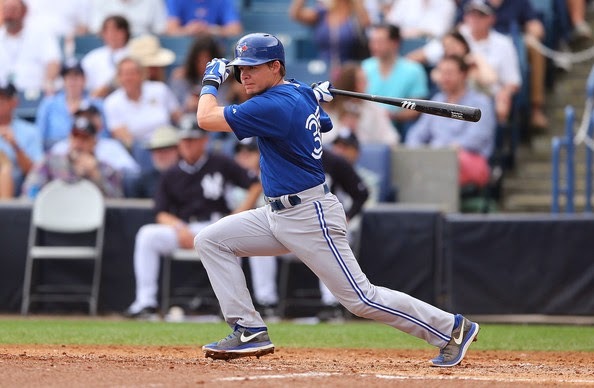 Just last week I was stumping for Munenori Kawasaki, who is already on the 40-man roster, and has at least one stand out skill (his ability to get on base against right-handed pitching) that the Jays could leverage to get something more than the absolutely nothing Goins was providing from the second base position. However, I can get with the decision to go with Getz instead of Kawasaki. Jose Reyes is back you guys! That's fantastic news for for the Blue Jays' middle infield which, since Maicer Izturis' unfortunate run-in with the dugout steps, has consisted of various combinations of Ryan Goins, Jonathan Diaz and fan-favourite Munenori Kawasaki. It's a pretty unspectacular trio, and that's if I'm being generous. Reyes' return certainly helps the cause now that he'll be manning shortstop pretty much every day, but that still leaves Ryan Goins and Jonathan Diaz as the only keystone options now that Kawasaki has been sent back to Buffalo. Quite frankly, I'm still not convinced that Muni isn't the best of a bunch of pretty unpalatable options. I know I'm going after some pretty low hanging fruit by continuing to harp on the club's second base situation, but it remains the blackest hole in the lineup and the one for which we should have the least hope of positive regression riding to the rescue. For whatever reason, the club seems insistent on riding out the Ryan Goins experiment for the time being, with all indications pointing to him remaining if not the every day second baseman, at least the "strong" side of a platoon. I just can't help wondering how much rope he'll be given when there's a potential upgrade (as underwhelming as it may be) toiling away in AAA. "Several Jays players discussed deferring portions of their salaries to clear payroll for Santana last month, according to major league sources. The discussions, which apparently did not progress past the conversation stage, raise new questions about the Jays' payroll flexibility for 2014." I'd bloody well say so! Now, I don't know if it really raises "new" questions about payroll flexibility, but it certainly suggests a few answers to the questions that fans have been asking all off-season. Specifically, why did the club seem so disinterested in pursuing upgrades on the free agent market despite having such obvious needs and supposedly occupying a commanding position in comparison to other teams? Was Anthopoulos unwilling to exceed his own valuations of the available players and spend money that was available to him (as he and Paul Beeston have always claimed it is)? Or had Rogers, as we've seen them do in the past, yanked the purse strings shut, forcing the front office to resort to shuffling around the clubhouse with a battered Tim Horton's cup hitting the players up for whatever they could spare? "It is not clear whether the impetus for the talks about deferring money came from the players or from the Jays' front office. The players, however, likely would not have engaged in such discussions unless they believed the team was unable or unwilling to pay Santana $14 million." And yes, it's really, really, really hard to believe that the topic of salary deferral would have been broached by management, although given Rogers' previous willingness to hang the team out to dry by withholding the financial resources necessary to hold a competitive window open longer than a single season it might not be as hard to believe as it should be. Obviously the situation is worse if the front office were forced to ask players to restructure their contracts than if the players proposed the idea themselves, but the PR implications of this story getting out are pretty disastrous either way. The generous reading of the situation might be that core members of the team (John Lott has reported it was Edwin, Bautista, Reyes, Dickey and Buehrle) believe so strongly in the team that they selflessly volunteered to put some of their own skin in the game in what can only be considered the ultimate team-first move. How's that for "chemistry"? The less generous and probably more realistic reading is that the players were just as frustrated by this off-season as fans were, and when it seemed the team was on the brink of landing Santana the players threw up their arms in exasperation, turned to the faceless corporate monolith that is Rogers and shouted "Well if you're not willing to do what it takes to make this thing happen we'll just do it ourselves!" Obviously that's bleak enough without even considering the possibility that the front office has been put in such tight spot with regards to payroll that they were forced to consider rolling a hand grenade into whatever remaining free agent appeal they have left and blowing it all to smithereens by asking the players to shoulder more than their fair share of the burden of putting a competitive team on the field. The list of disadvantages that Blue Jays general managers must overcome to acquire free agent talent is already long enough; playing in a strange frozen land, having to deal with customs every road trip, the turf, the twenty year run of achieving little but A.L. East also-ran status. Pile on yet more evidence of a corporate owner with only an occasional interest in actually winning baseball games, and the uphill climb the team already faces every off-season gets just a little bit steeper. I really hope that Andrew Stoeten is onto something when he suggests here and here at Drunk Jays Fans, that the front office is letting this stuff to get out there in hopes of shaming Rogers into investing a bit more into fielding a winner, not that we have any reason to believe that the soulless corporate entity that owns our favourite ball club has any capacity to feel shame. 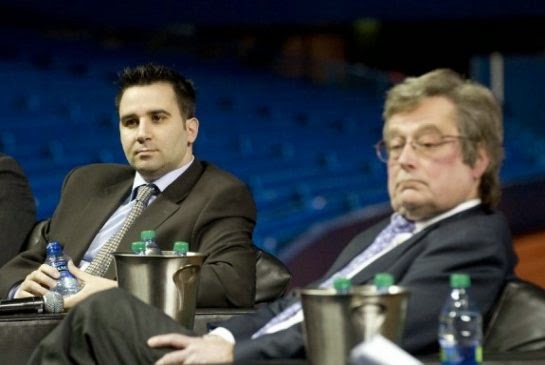 It would give me great comfort to believe that the people making baseball decisions are as frustrated by this kind of crap as fans are, because even with their missteps I still believe Anthopoulos and Beeston are too smart to have knowingly put themselves in this kind of situation when they shoved so much money and prospect capital into the pot last off-season. Whatever, though. I'm not going to let Rogers ruin what should have remained a day of optimism and excitement for Jays fans. It's the home opener! Ol' Dusty McG back on the bump as a starter for the first time since... well it's best not to think about it anyways. We get to witness Masahiro Tanaka's major league debut, and for reasons I've yet to really put my finger on I'm still more optimistic about these Blue Jays that most. This is supposed to be fun, and it should be. So for now let's forget about a bunch of Rogers bean counters doing their damnedest to once more shatter the dreams of Blue Jays fans everywhere.